Today I awoke to the USGS earthquake notification service email about an earthquake offshore of Sulawesi, Indonesia. There was an earthquake with a magnitude M 6.8 to the southeast of the Donggala/Palu earthquake from 28 September 2018. Here is the comprehensive earthquake report for the Donggala/Palu earthquake, landslides, and tsunami. Just like the September quake, today’s event was a strike-slip earthquake, where the crust moves side-by-side (like the San Andreas fault). This region of the world is complicated and special. There are subduction zone and transform plate boundaries. 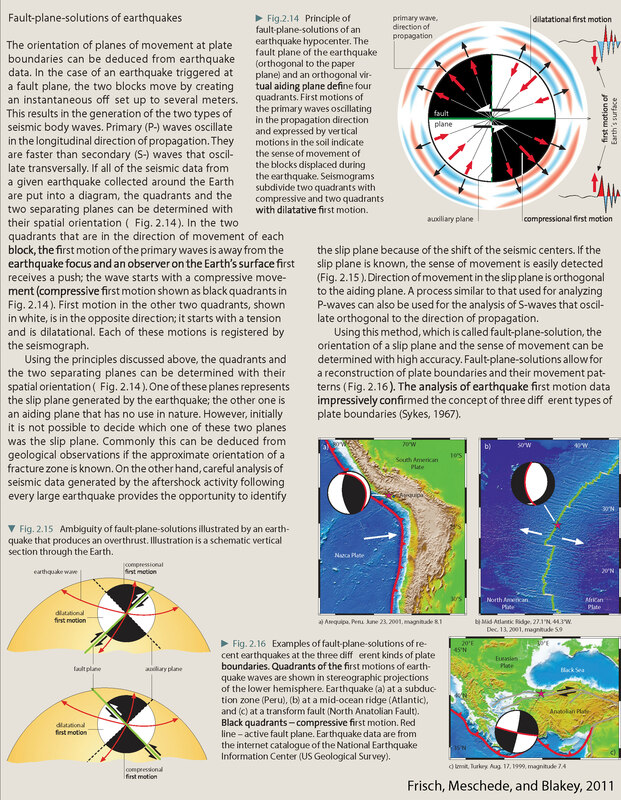 I use several maps below to present how these plate boundaries control the types of earthquakes. First I plot the earthquakes from the past year, then for the past century. Of course, let’s remember that seismometers are not that old, so the first half of the 20th century, there were not many seismometers. So, the earthquake record before the 1950s is generally composed of earthquakes with larger magnitude. There are many many faults in this region, overlapping each other, offsetting each other. And, there have been earthquakes along many of these systems over the past year and past century that represent these different systems and how they interact. The bivergent convergent zone of the Molucca Strait trends towards Sulawesi from the north. The strike-slip Sorong fault (on north side of Papua New Guinea) enters the region from the east. The Sorong fault goes through Sulawesi, forming the Palu-Koro fault, responsible for the Donggala/Palu earthquake, landslides, and tsunami happened last year. There was an interesting earthquake along this transition in Sulawesi on 29 May 2017. This earthquake may have triggered the Donggala/Palu earthquake due to changes in static coulomb stress (though nobody has done those analyses yet, as far as I know). To the south is the convergent plate boundary between the Australia and Sunda plates. There was a sequence of earthquakes on a backthrust (the Flores thrust fault) to this subduction zone last year. This subduction/collision zone extends westwards and joins the Alpide belt, the longest convergent plate boundary on earth. Most notably, this plate boundary was responsible for the 2004 Sumatra-Andaman subduction zone earthquake. The M 6.8 temblor is strange because it is oriented in a way that is different from the mapped faults in the region. The mainshock/aftershock sequence suggests a northeast-southwest oriented fault (making this a right-lateral strike slip earthquake). The mapped faults with this orientation are instead left-lateral faults. I plot the seismicity from the past month, with color representing depth and diameter representing magnitude (see legend). I include earthquake epicenters from 1918-2018 with magnitudes M ≥ 4.5 and M ≥ 7.5 in different versions. In the M 7.5 map below, I include a transparent overlay of the magnetic anomaly data from EMAG2 (Meyer et al., 2017). As oceanic crust is formed, it inherits the magnetic field at the time. At different points through time, the magnetic polarity (north vs. south) flips, the North Pole becomes the South Pole. These changes in polarity can be seen when measuring the magnetic field above oceanic plates. This is one of the fundamental evidences for plate spreading at oceanic spreading ridges (like the Gorda rise). In the upper right corner is an overview map from Zahirovic et al. (2014) that shows the major plate boundary faults and tectonic plates. I placed a blue star in the general location of yesterday’s M 6.8 temblor. The map in the upper left corner shows one interpretation of these faults as presented by Bellier et al. (2006). The M 6.8 quake happened somewhere in the intersection of the Batui thrust (an extension of the Molucca Collision) and the Sorong fault. There are half a dozen different interpretations for the tectonics here, this is but one. The map in the lower left corner is a map from Cipta et a. (2006) that shows the relative seismic hazard for Sulawesi. Compare this map with the Bellier map above. Note how the seismic hazard is directly related to the known earthquake faults. In the lower right corner is a low-angle oblique view of the plates and their boundaries in this part of the world (Hall, 2011). I present this figure alone below to highlight the details of how these faults interact near the M 6.8 quake. Here is the map with a year’s seismicity plotted for quakes M ≥ 4.5. Earthquakes from the past year represent well many of the plate boundaries here. 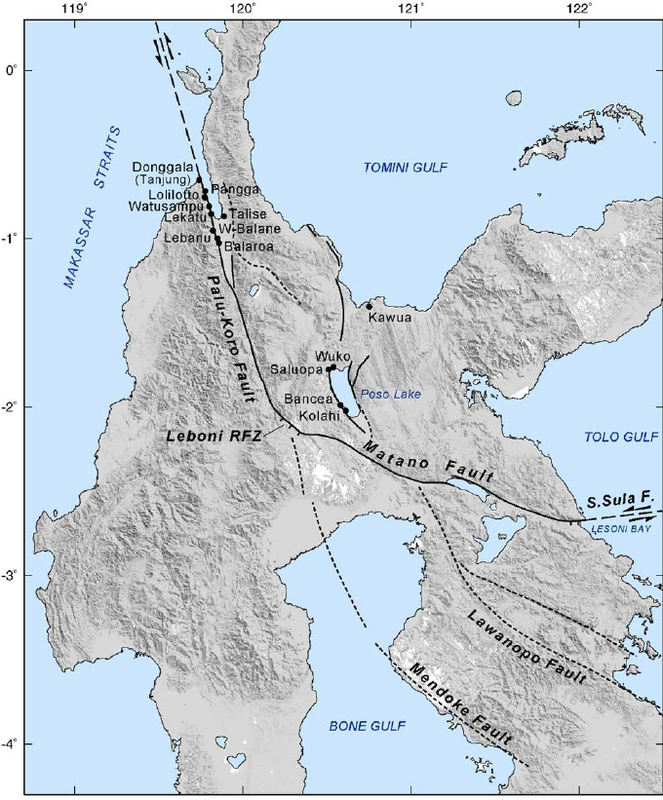 Notably is the Donggala/Palu sequence, with all the aftershocks, that align with the trend of the Palu-Koro fault as it connects to the south tot he Sorong fault system. There are several quakes along the Java trench (the Sunda subduction zone), showing thrust quakes (e.g. 2.18, 8.28, and 10.1 in 2018 and 1.21 and 1.22 in 2019). 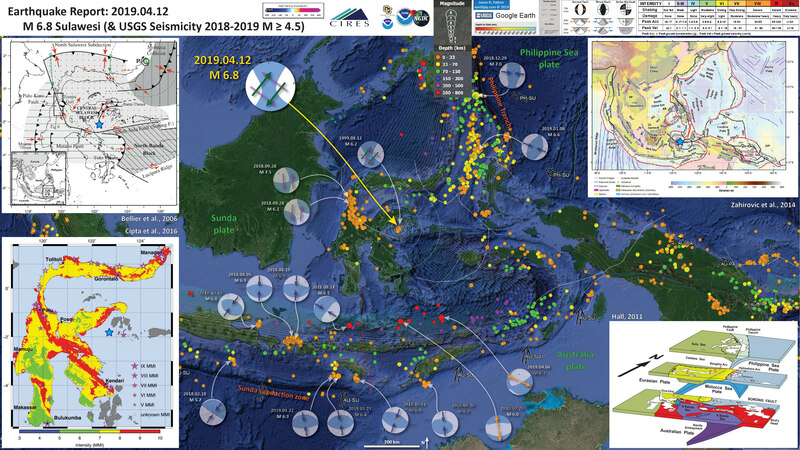 The Lombok sequence of 2018 is also evidence of this north-south convergence. 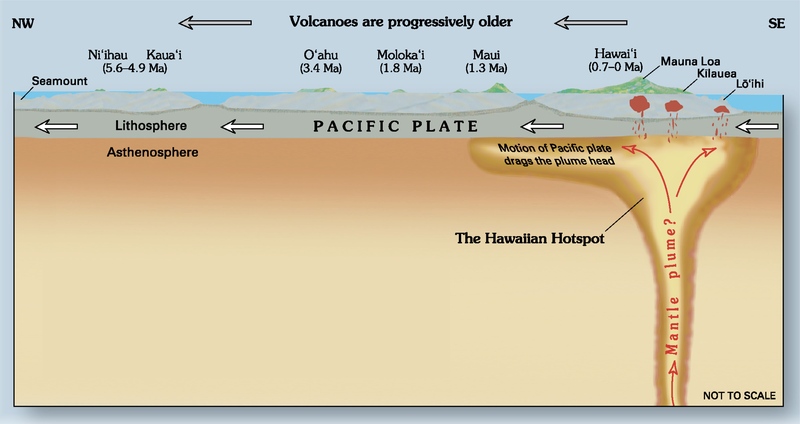 As the Australia plate dives deep beneath the Sunda plate, the slab (the oceanic crust) pulls downwards, causing extension. The 2018.07.28 M 6.0 and 2019.04.06 normal fault earthquakes (orange arrows) are great examples of this. Intermediate depth earthquakes are not completely understood, but we learn more every year. For example, sometimes there are compressional quakes (thrust/reverse) that happen at these depths, e.g. the 2018.08.17 M 6.5 quake. One of the more active regions is the Molucca Strait, where there are subduction/convergent zones that oppose each other. The 2019.01.06 M 6.6 shaker is a good example of what can happen here (and does rather frequently). Further north is the subduciton zone that forms the Philippine trench. There was a M 7.0 earthquake on 2018.12.29 that shows evidence of the subduction zone megathrust. Here is the map with a century’s seismicity plotted for quakes M ≥ 7.5. The USGS earthquake catalog includes additional examples of larger quakes over the past century that represent the range of plate boundary types in the region. The global earthquake catalog is better after 1950 due to the increase in seismic monitoring during the cold war (monitoring for nuclear weapons testing). 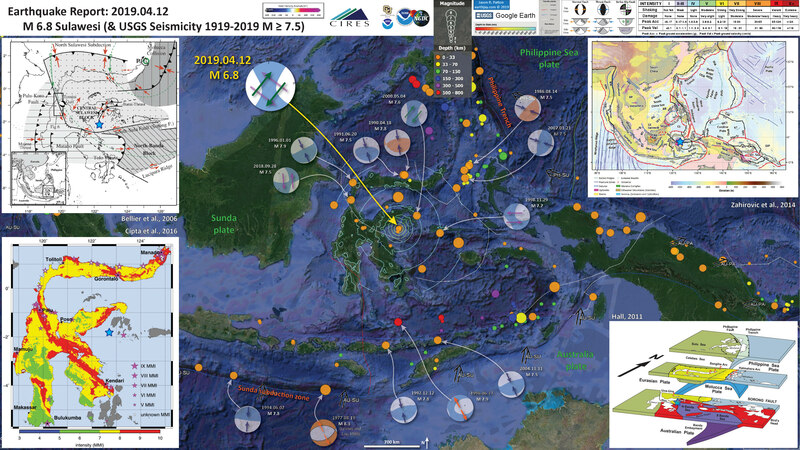 Evidence for subduction along the Sunda subduction zone include subduction zone earthquakes (1977.08.19 M 8.3, 1994.06.02 M 7.8). Also, evidence for down-dip slab-pull extension as evidenced by the 1996.06.17 M 7.9 temblor. similar to the 2018 Lombok sequence, there are also examples of the backthrust to the subduction zone (e.g. 1992.12.12 M 7.8 and 2004.11.11 M 7.5). The Molucca Strait thrust earthquakes are evidence for this bivergent convergence (e.g. 1986.08.14 M 7.5 and 2007.01.21 M 7.5). There is also a subduction zone on the north side of Sulawesi, with several good example earthquakes (e.g. 1990.04.18 M 7.5, 1991.06.20 M 7.5, and 1996.01.01 M 7.9, which was tsunamigenic). There was a strike-slip earthquake on 1998.11.29 that is related to the Sorong fault system, a magnitude M 7.7 shaker. This is the small scale tectonic map of the region (Zahirovic et al., 2014). This gives us the overview we need so we can understand the wide variety of plate boundary faults and how they interact with each other. Here is the tectonic map from Bellier et al., 2006. I include their caption below in blockquote. Note how the Molluca Collision faults trend towards the Batui thrust. However, when we look more closely at the faulting on a local scale, things get much more complicated. Here is the larger scale map showing the fault configuration in this region (Bellier et al., 2006). I include this so we can see how the Sorong fault system extends and relates to the Palu-Koro system. Here is the low-angle oblique view of this region. Note the left-lateral strike-slip fault bisecting Sulawesi. Note the Sorong fault system that trends towards this system. The Sorong fault ends in a convergent plate boundary in eastern Sulawesi (the Batui thrust). There is a small north-south fault linking these two systems on the western part of hte N Banda Sea. The M 6.8 earquake happened in this area. We will look at more detailed maps of this area. Here is another interpretation showing how these faults map interact in the region (Simandjuntak and Barber, 1996). Yesterday’s M 6.8 quake happened southwest of Banggai. Talaud orogeny in the North Moluccas. Line of section illustrated in Fig. 9 is indicated. This is larger scale, showing details for the Sulawesi region (Simandjuntak and Barber, 1996). Sulawesi orogeny. Line of section illustrated in Fig. 9 is indicated. Below are a couple maps from Watkinson et al. (2011) that show detailed mapping in this area. First here is a fault tectonic map based on new (2011) interpretations. These interpretations are based on detailed seismic reflection data, as well as high resolution multibeam mapping (detailed information about the surface of the seafloor). Map of the same area as Figure 1, and drawn largely after the same sources, but modified in the light of the present study. Revised faults are shown in red. Principal differences include the absence of a through-going Sula Thrust, the Sorong Fault as a plate boundary which does not reach the surface, and connection of the Poh Head fault to the region of dextral transpression in the west of the study area. Sources of deformation in the region are indicated by regions of colour. Here is a regional map showing multibeam bathymetry along with fault line interpretations. This is “figure 3; note the extent for “figure 8,” which is the figure i present next. (a) Shaded relief map of the multibeam data. See inset map for location. Illumination from the NW. (b) Interpreted structural map, showing fault kinematics, basin areas, and fields of debris derived from the collapsing slope in the south. Locations of subsequent figures shown. Here is the detailed map of the seafloor geomorphology (Watkinson et al., 2011). This map is northeast of the island of Banggai, but it informs us about the northeast oriented faults, along with the northwest oriented faults. Note that the northwest oriented faults are right lateral (opposite sense of motion compared to the Sorong fault system, which makes interpreting the M 6.8 more complicated). Also, north how the northwest striking (oriented) faults are left-lateral strike-slip systems. This is also opposite the sense of motion for the M 6.8 earthquake (and also for the 1999.08.12 M 6.2 quake (see the year’s seismicity interpretive poster above). So, we have a mystery. What fault system is responsible for the 2019.04.12 M 6.8 and 1999.08.12 M 6.2 quakes. So exciting! Multibeam image showing details of the region of dextral transpression in the west of the study area. See Figure 3b and inset map for location. Antiformal hinge lines marked by black dashed lines, thrusts marked by white dashed lines. Strike-slip faults marked by double half arrows. Maximum horizontal stress orientations for various structures shown in top right. Next, lets look at the evidence for subduction along the Sunda subduction zone. Below is a map showing historic seismicity (Jones et al., 2014). Cross sections B-B’ and C-C’ are shown. The seismicity for the cross sections below are sourced from within each respective rectangle. Simandjuntak, T.O. and Barber, A.J., 1996. Contrasting tectonic styles in the Neogene orogenic belts of Indonesia in Hall, R. & Blundell, D. (eds), 1996, Tectonic Evolution of Southeast Asia, Geological Society Special Publication No. 106, pp. 185-201. Socquet, A., Simons, W., Vigny, C., McCaffrey, R., Subarya, C., Sarsito, D., Ambrosius, B., and Spakman, W., 2006. 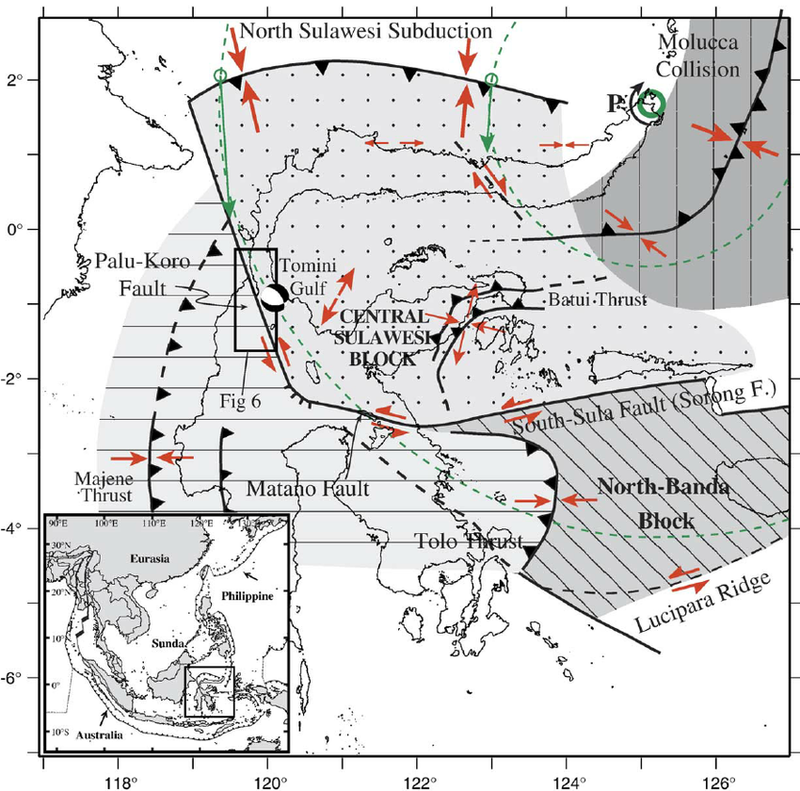 Microblock rotations and fault coupling in SE Asia triple junction (Sulawesi, Indonesia) from GPS and earthquake slip vector data, J. Geophys. Res., 111, B08409, doi:10.1029/2005JB003963.